Sales funnel templates for marketing or business - Free Download Now! What is the Sales funnel templates slide for? The sales funnel is a marketing tool that allows you to monitor, analyze and plan sales. 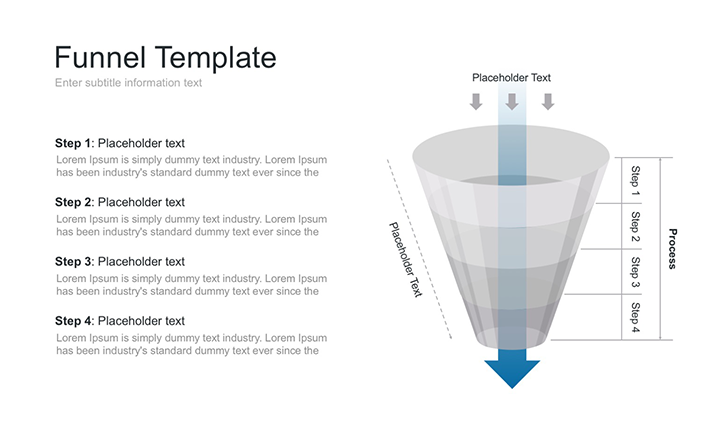 The Sales funnel templates, in its turn, is a premade slide devoted to this model. The sales funnel demonstrates the distributional principle of potential customers throughout various stages of the model starting from the awareness of the product to the concluding the deal. The consumer funnel reflects the quality of management, the level of managers’ competence, the need for intensification of actions at any stage of sales. The funnel has become a very efficient metaphorical figure. In an accessible and visually attractive form, it demonstrates how the customers flow from the point of consumer interest to the point of purchase. Be aware of all business processes. Consider in detail the process of client’s moving to the goal, identify the moments that can slow down, pause, reverse or lead the client aside. Identify the ratio of the number of people interested in this product to the actual number of buyers. Determine the duration of each stage. reduction of the marketing costs by reducing the number of ineffective shares. A clear visual scheme of this unique premade slide plays a significant role in the structure of the slide. It allows you to visualize information, describe the topic logically and vividly so that your listeners will be involved and remember your speech. The text block is located on the left side of the slide and helps to explain the scheme. The template has all necessary elements for a convenient and easy work. It is equipped with standard fonts, built-in tools, necessary Aspect ratios, retina ready. High quality – the template has perfect quality without any visible defects in any case. Editable vector elements – you can edit any built-in tools. A multipurpose slide – the slide will be a useful tools for entrepreneurs, marketers, businessmen. A premade easy-to-use slide – it saves time and simplifies responsibilities.